When done right, there is new business to be found through the Internet. However, it takes time, effort and knowledge when trying to reach the right markets. Larry Mersereau presented "Conquer The Screen, Corner The Market" during the ISSA/INTERCLEAN 2014 Trade Show. He reviewed a planning, execution and measurement process for an online marketing program that can be implemented immediately. It’s easy to become overwhelmed when trying to manage a company’s website, along with specific social media networks such as Facebook, Twitter and LinkedIn. When done right, there is new business to be found through the Internet. However, it takes time, effort and knowledge when trying to reach the right markets online. 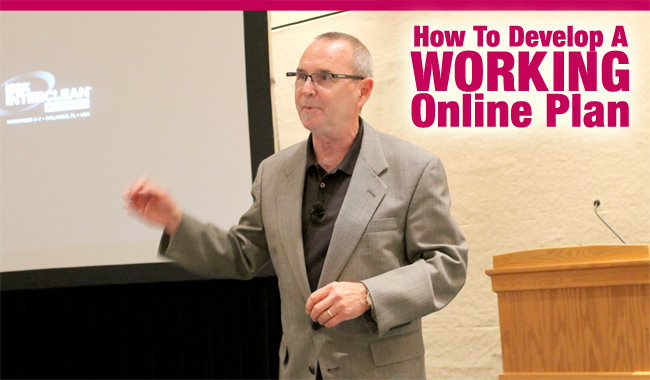 According to Mersereau, a business growth speaker for PromoPower, in an age when buyers spend more time staring at a computer screen, many companies need to better connect with their target audiences. Mersereau reviewed a complete planning, execution and measurement process for an online content marketing program that can be implemented right away. Whether it’s attracting potential customers to a company’s website or trying to generate interest in specific social media networks, Mersereau said proper planning is essential for success. A good plan includes five basic parts: goals, target audience, measurement, platform and execution. The second step to a good online plan is understanding the target audience, and how to successfully reach that audience. Important goals many companies have when looking at online marketing include improved presence, improved sales leads, and/or improved engagement with a target audience. This can be done through various forms of content provided on a website and/or such social media networks as Facebook and Twitter. However, according to Mersereau, providing a “ton of information” about a company will not lead to automatic success. A specific goal must be put into play. “There are a lot of people who become active on social media, such as Twitter, and still fail to attract new customers. They don’t have a specific goal to follow,” Mersereau said. “Maybe their target audience is not looking on Twitter. Or, maybe the company fails to properly promote itself. (www.contentmarketinginstitute.com), which he said provides valuable information for companies looking for help with their marketing objectives. These goals are: brand awareness, lead generation, customer acquisition, thought leadership, engagement, customer retention, website traffic, lead nurturing and sales. According to Mersereau, “brand awareness” centers around the importance of a company increasing its Web presence. “Lead generation,” meanwhile, focuses on getting people to respond to a company’s online presence such as a website. “If you are going to use your website and/or specific social media to generate leads, it’s good to make no-risk offers that (your target audience) cannot resist,” Mersereau said. “How many times have you seen an offer through an email for a free deal, and then there is a whole page of information that the company wants from you? It wants way too much information. Mersereau emphasized again that it’s vital that a company reaches its true target audience when providing online offers. “You can offer free iPhones and receive 1 million responses. But, these 1 million people might not be your true prospects. You want to offer things that are specific to your prospects,” Mersereau said. Two other organizational goals that Mersereau discussed included “customer acquisition,” which is the act of attracting people to a company’s online presence so that they can place orders; and “thought leadership,” which is when a company offers various insights for the benefit of current and potential customers. The organizational goal “engagement” sets out to establish a relationship with a potential customer via an online presence, while “customer retention” focuses on the act of staying connected with a customer online to keep that person “in touch” with the company and remain part of the company’s community. “The objective here is to keep them involved, so they will buy from you on a continuous basis,” Mersereau said. Mersereau said he has found it’s best to focus on one organizational goal at a time when working on an online marketing plan. Trying to reach too many goals at once can become a daunting task. Having the greatest online marketing plan in the world will make no difference if it doesn’t reach the desired audience. When it comes to success with websites and specific social media networks, those in charge of marketing should truly know their target audiences, and where they can be reached. “Most companies already pretty much know what size of businesses they serve well, and what their customers’ true needs are, due to past success. Therefore, it should be fairly easy for them to figure out their target audience,” Mersereau said. Mersereau listed a wide variety of social media websites and references that are used everyday to help connect companies with current and potential customers. He recommended that a business getting started on social media should focus on one network at a time. Too much, too soon can lead a company’s online presence without a steady anchor. According to Mersereau, when it comes to B2B activity, LinkedIn is the most popular social media network, while Facebook remains No. 1 for those companies conducting business-to-consumer activity. “For B2B, LinkedIn is pretty much where everybody is now. If that is where you think your target customers are active, then I would say it’s time to set a goal and start posting information on LinkedIn that only your target customers would want,” he said. Mersereau added that a successful online marketing campaign is not necessarily about a large following. “If you have 1,000 online friends and 950 of them are people who are never going to do business with you, then you are working real hard reaching out to people who hold no value to your company. That is why choosing the right medium is so important,” Mersereau said. Once goals are identified, and the target audience is known, the next critical step to developing a strong online marketing plan is “content.” Company marketing officials should ask themselves: What exactly is it that our company should provide in the form of content that current and potential customers will see as having real value? Mersereau said there are three different kinds of content: created, curated and consumer generated. “Created content involves ‘your own stuff,’ such as a blog. I would recommend that if you are not a writer, then don’t start a blog. Some people can write, and some people can’t write. If you can’t write, have somebody on your staff who is talented in this area maintain the blog,” Mersereau said. He cautioned that the number of blogs which haven’t had an entry in the past 12 months is staggering. “Curating content means you find other sources that have information that you think are valuable to your target customers, and you connect them to that information,” Mersereau said. “The hope is that you will become your customers’ search engine for information. Curation takes place all of the time on Twitter. You can provide a ‘tweet’ with information that may send a person to somebody else’s website. The problem is, you can be sending potential customers somewhere else and they may not come back. Mersereau recommends the latter, saying it’s important to have control over things that are posted, including videos and blogs. Today’s cloud storage capabilities can help. He noted that videos posted on YouTube, for example, are changed to the YouTube proprietary format, thus giving YouTube control over those videos. The third type of content Mersereau discussed was consumer generated. This is when customers provide content in the form of reviews, comments, participation in “ask the expert” articles, etc. This can be done via a company’s website and/or through specific social media networks. When in comes to content, Mersereau said video remains a very popular device for reaching people. “People love to watch video. It’s spoonfed. When they are watching a video, they don’t have to think a lot. They get the visual, they get the sound, they get the motion, they get everything but the aroma,” he said. “People are often afraid to post video online, however, because they feel the quality level will not be very good. Mersereau also spoke of the importance of posting an editorial calendar pertaining to online content. 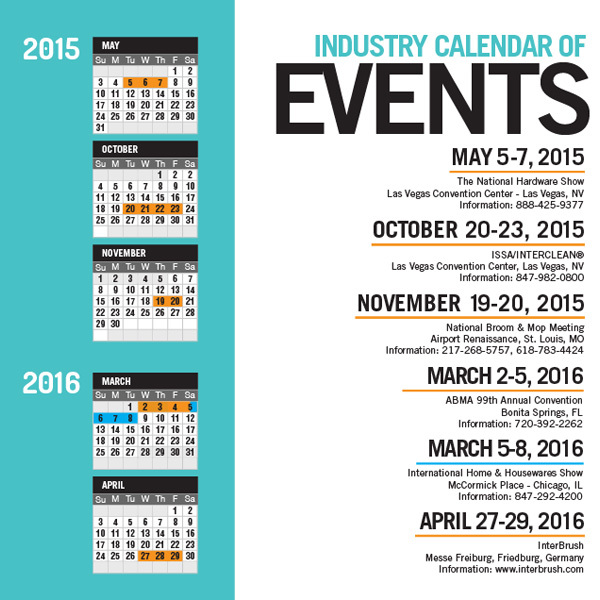 This informs members of the target audience what to expect on a scheduled basis. “You want people looking for your information, and to know when they can receive it on a regular basis. This is really important,” he said. For those who are wanting to start an online post it’s Mersereau’s recommendation to have at least a month’s worth of product ready. This is true whether it’s in written, audio and/or video format. According to Mersereau, the type of content most B2B buyers seek when looking at a company’s online presence, such as a website, includes pricing information; technical information about specific products; case studies such as articles, blogs and white papers; and shipping/delivery information. Finally, Mersereau said it’s important to accurately measure how well an online marketing program is working. “Measurement can include the number of views on a video, the number of clicks to a website, the number of responses being received and/or the number of people who are ‘following’ you,” he said. “If you are not getting noticed, you need to adjust. Visit www.promopower.com for more information. Import totals for the first 11 months of 2014 were up in five finished goods categories outlined: brooms of broom corn valued at more than 96 cents, brooms and brushes of vegetable material, shaving brushes, paint rollers and upright brooms compared to the first 11 months of 2013. In November 2014, four categories outlined recorded increases: brooms of broom corn valued at more than 96 cents, brooms and brushes of vegetable material, shaving brushes and upright brooms. The United States imported 24,964 kilograms of hog bristle in November 2014, up 185 percent from 8,771 kilograms imported in November 2013. During the first 11 months of 2014, 244,539 kilograms of hog bristle were imported, down 5 percent from 258,672 kilograms imported during the first 11 months of 2013. China sent 243,858 kilograms of hog bristle to the United States during the first 11 months of 2014. The average price per kilogram for November 2014 was $20.73, up 101 percent from the average price per kilogram for November 2013 of $10.31. The average price per kilogram for the first 11 months of 2014 was $15.85, up 8 percent from the average price per kilogram of $14.71 for the first 11 months of 2013. The import total of broom and mop handles during November 2014 was 1.5 million, the same as for November 2013. During the first 11 months of 2014, 16.9 million broom and mop handles were imported, up 19 percent from 14.2 million for the first 11 months of 2013. During the first 11 months of 2014, the United States received 9.5 million broom and mop handles from Brazil, 3.5 million from Honduras and 2.4 million from China. The average price per handle for November 2014 was 79 cents, down 10 percent from 88 cents for November 2013. The average price for the first 11 months of 2014 was 91 cents, up 5 percent from 87 cents for the first 11 months of 2013. November 2014 imports of brush backs totaled 573,311, up 5 percent from 545,015 for November 2013. During the first 11 months of 2014, 6 million brush backs were imported, up 13 percent from 5.3 million for the first 11 months of 2013. Canada sent 2.9 million brush backs to the United States during the first 11 months of 2014, while Sri Lanka shipped 2.4 million. The average price per brush back was 49 cents during November 2014, the same as for November 2013. For the first 11 months of 2014, the average price per brush back was 45 cents, down 4 percent from the average price for the first 11 months of 2013 of 47 cents. The import total of metal handles during November 2014 was 1.4 million, down 33 percent from 2.1 million for November 2013. During the first 11 months of 2014, 27.3 million metal handles were imported, up 19 percent from 23 million for the first 11 months of 2013. During the first 11 months of 2014, Spain exported 11 million metal handles to the United States, while China shipped 7.8 million and Italy sent 7.4 million. The average price per handle for November 2014 was $1.30, up 73 percent from 75 cents for November 2013. The average price for the first 11 months of 2014 was 88 cents, up 22 percent from the average price for the first 11 months of 2013 of 72 cents. The United States imported 575,401 brooms of broom corn valued at more than 96 cents per broom during November 2014, up 2 percent from 565,282 for November 2013. During the first 11 months of 2014, 7.4 million brooms of broom corn were imported, up 3 percent from 7.2 million for the first 11 months of 2013. Mexico shipped 7.3 million brooms to the United States during the first 11 months of 2014. The average price per broom for November 2014 was $2.53, up 5 percent from the average price for November 2013 of $2.42. The average price per broom for the first 11 months of 2014 was $2.51, up 6 percent from $2.37 for the first 11 months of 2013. The import total of brooms and brushes of vegetable material during November 2014 was 323,290, up 199 percent from 108,233 brooms and brushes imported during November 2013. During the first 11 months of 2014, 2.4 million brooms and brushes were imported, up 33 percent from 1.8 million for the first 11 months of 2013. 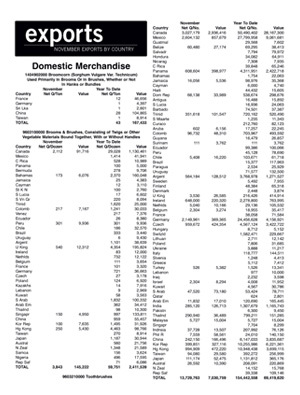 Sri Lanka exported 1.4 million brooms and brushes to the United States during the first 11 months of 2014. The average price per unit for November 2014 was $1.24, down 42 percent from $2.14 for November 2013. The average price for the first 11 months of 2014 was $1.42, up 6 percent from the average price recorded for the first 11 months of 2013 of $1.34. The United States imported 74.1 million toothbrushes in November 2014, down 2 percent from 75.3 million imported in November 2013. During the first 11 months of 2014, 924.2 million toothbrushes were imported, down 5 percent from 969.7 million imported during the first 11 months of 2013. China sent 704.2 million toothbrushes to the United States during the first 11 months of 2014, while Vietnam shipped 44.6 million. The average price per toothbrush for November 2014 was 24 cents, up 1 cent from November 2013. The average price for the first 11 months of 2014 was 24 cents, also up 1 cent from the first 11 months of 2013. November 2014 imports of hairbrushes totaled 3.6 million, down 32 percent from 5.3 million for November 2013. During the first 11 months of 2014, 33 million hairbrushes were imported, down 25 percent from 44.2 million for the first 11 months of 2013. China shipped 32.8 million hairbrushes to the United States during the first 11 months of 2014. The average price per hairbrush was 27 cents during November 2014, down 7 percent from the average price for November 2013 of 29 cents. For the first 11 months of 2014, the average price per hairbrush was 28 cents, up 1 cent from the average price for the first 11 months of 2013. The United States imported 10 million shaving brushes in November 2014, up 138 percent from 4.2 million imported in November 2013. During the first 11 months of 2014, 104.5 million shaving brushes were imported, up 101 percent from 51.9 million imported during the first 11 months of 2013. Germany sent 49.4 million shaving brushes to the United States during the first 11 months of 2014, while China shipped 37.6 million. The average price per shaving brush for November 2014 was 8 cents, down 58 percent from the average price for November 2013 of 19 cents. The average price for the first 11 months of 2014 was 10 cents, down 38 percent from the average price for the first 11 months of 2013 of 16 cents. The import total of paint rollers during November 2014 was 3.5 million, the same as for November 2013. During the first 11 months of 2014, 48.7 million paint rollers were imported, up slightly from 48 million during the first 11 months of 2013. China sent 37.4 million paint rollers to the United States during the first 11 months of 2014, while Mexico exported 8.1 million. The average price per paint roller for November 2014 was 49 cents, down 8 percent from 53 cents for November 2013. The average price for the first 11 months of 2014 was 50 cents, down 6 percent from the average price of 53 cents for the first 11 months of 2013. U.S. companies imported 13.5 million paintbrushes during November 2014, down 21 percent from 17.1 million paintbrushes imported during November 2013. Paintbrush imports for the first 11 months of 2014 were 203.6 million, down 8 percent from 221.1 million recorded for the first 11 months of 2013. China shipped 184.4 million paintbrushes to the United States during the first 11 months of 2014. The average price per paintbrush for November 2014 was 28 cents, down 10 percent from 31 cents for November 2013. The average price for the first 11 months of 2014 was 29 cents, up 7 percent from 27 cents for the first 11 months of 2013. The total import of upright brooms for November 2014 was 1.5 million, up 25 percent from 1.2 million for November 2013. During the first 11 months of 2014, 14.1 million upright brooms were imported, up 8 percent from 13 million imported during the first 11 months of 2013. China sent 12 million upright brooms to the United States during the first 11 months of 2014. The average price per broom for November 2014 was $1.49, down 9 percent from the average price for November 2013 of $1.64. The average price per broom for the first 11 months of 2014 was $1.54, the same as for the first 11 months of 2013. Export totals for the first 11 months of 2014 were up in three categories outlined: shaving brushes, artist brushes and paintbrushes. In November 2014, three categories outlined reported increases: toothbrushes, shaving brushes and paintbrushes, compared to November 2013. The United States exported 3,843 dozen brooms and brushes of vegetable materials during November 2014, down 22 percent from the November 2013 total of 4,947 dozen. Exports of brooms and brushes of vegetable materials during the first 11 months of 2014 were 59,751 dozen, down 26 percent from 80,895 dozen for the first 11 months of 2013. The United States sent 29,028 dozen brooms and brushes to Canada during the first 11 months of 2014. The average price per dozen brooms and brushes was $37.79 in November 2014, down 16 percent from $44.73 for November 2013. The average price per dozen brooms and brushes for the first 11 months of 2014 was $40.36, down 5 percent from $42.62 for the average price per dozen for the first 11 months of 2013. During November 2014, the United States exported 13.7 million toothbrushes, up 29 percent from the total recorded in November 2013 of 10.6 million. During the first 11 months of 2014, 154.4 million toothbrushes were exported, down 6 percent from 163.4 million exported during the first 11 months of 2013. The United States exported 50.5 million toothbrushes to Canada during the first 11 months of 2014, while sending 27.8 million toothbrushes to Mexico and 24.5 million to Germany. The average price per toothbrush for November 2014 was 51 cents, down 7 percent from 55 cents for November 2013. The average price per toothbrush for the first 11 months of 2014 was 45 cents, up 1 cent from the first 11 months of 2013. ﻿The United States exported 2.2 million shaving brushes during November 2014, up 57 percent from 1.4 million shaving brushes exported for November 2013. During the first 11 months of 2014, 15.1 million shaving brushes were exported, up slightly from 15 million during the first 11 months of 2013. Brazil imported 4.5 million shaving brushes from the United States during the first 11 months of 2014, while Mexico received 3.4 million, and Canada was sent 3.3 million. The average price per shaving brush for November 2014 was 84 cents, down 36 percent from the average price for November 2013 of $1.31. The average price for the first 11 months of 2014 was $1.22, up 23 percent from 99 cents recorded for the first 11 months of 2013. November 2014 exports of artist brushes totaled 947,237, down slightly from the November 2013 total of 948,480 artist brushes. During the first 11 months of 2014, 10.3 million artist brushes were exported, up 17 percent from 8.8 million for the first 11 months of 2013. Canada received 6.4 million artist brushes from the United States during the first 11 months of 2014. The average price per artist brush was $2.58 during November 2014, up 28 percent from the average price for November 2013 of $2.02. For the first 11 months of 2014, the average price per artist brush was $2.58, up 2 percent from the average price for the first 11 months of 2013 of $2.53. The export total of paintbrushes during November 2014 was 102,963, up slightly from 101,820 for November 2013. During the first 11 months of 2014, 1.5 million paintbrushes were exported, up 25 percent from 1.2 million during the first 11 months of 2013. Canada imported 588,136 paintbrushes from the United States during the first 11 months of 2014. The average price per paintbrush for November 2014 was $13.38, down 10 percent from $14.82 for November 2013. The average price for the first 11 months of 2014 was $15.81, down 9 percent from $17.41 recorded for the first 11 months of 2013.
Business Development John C. Cottam; and Lakeland, FL, Plant Manager Patrick Linn. • Director of Technology and Business Development: John C. Cottam recently joined IBC and has been named to this position. He has worked for the past 10 years in IT management and software architecture development. John C. Cottam has a computer science degree and an MBA. He will assume responsibility for company IT management, technological improvements, brush technical expertise and new business development. It was also announced that Patrick Linn recently joined IBC as the manager of the company’s Lakeland, FL, plant. He has experience and education in industrial plant management, including work with several quality control and improvement systems. Linn recently relocated to Florida from the Midwest. A rendering of IBC's new headquarters in St. George, UT. 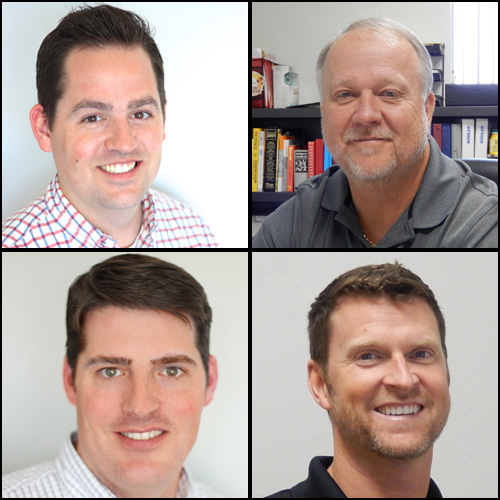 In July 2014, IBC relocated its Pomona, CA, manufacturing plant, sales and administrative offices and corporate headquarters to St. George, UT. According to the company, IBC moved to a new, more efficient and lower cost building. The St. George location, the company added, provides a lower cost of doing business, fewer regulations and less taxation as well as a family-friendly environment with a greatly reduced cost of living for IBC employees. The new location continues to provide IBC with a West Coast presence and equal or better freight costs. The Lakeland, FL, plant was most recently expanded in 2006 and was not affected by this move. 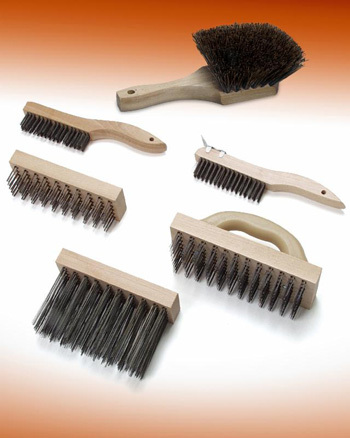 Visit www.industrial-brush.com for more information. The "Made in the USA" Brooms & Brushes line will be integrated into the Malish product offering. The addition of the “Made in the USA” Brooms & Brushes’ product line will provide an important adjunct to the existing line of Malish color-coded foodservice products, according to The Malish Corporation. The new line will be integrated into the Malish product offering and will be marketed under the “Brooms & Brushes by Malish” moniker, so as to minimize any confusion for existing customers of the Brooms & Brushes product line. The Brooms & Brushes product line currently includes grill and pizza oven brushes, counter dusters, floor squeegees and more. Monterey Mills COO Brent Birkhoff; and Grand Prize award winner Alyssa Gonzalez. The award was presented by Monterey Mills COO Brent Birkhoff, in a ceremony at Savannah College of Art and Design on March 6. Twelve prizes were awarded in this year’s competition: one grand prize, three second places, five third places, and three honorable mentions. In all, $4,100 in prizes were awarded to students, and $2,500 in scholarship funds were donated to participating schools. 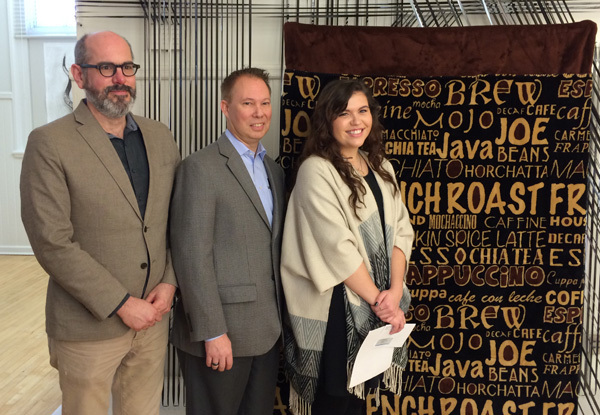 Students from seven colleges and universities across the country participated in this opportunity to design a throw, adding to Denali’s 2016 collection. Denali double-sided throws are designed to bring the consumer a new level of warmth and softness, according to the company. These throws are made from a fabric 20 years in the making. Called Microplush™, the high-tech pile fabric is knitted with a very fine denier acrylic fiber making it light, soft and comfortable to the touch. “I have yet to meet a person who doesn’t say that this is the warmest throw that they have ever had,” Sinykin said. Visit www.designathrow.com for more information. Monterey Mills’ products include: knitted pile fabric used for paint rollers, wool and wool blended buffing pads, hospital pads, wash mitts and wash mitt fabric, apparel, the Denali Home Furnishing line, and fabric manufactured for industrial applications. Visit www.montereymills.com for more information. "﻿The broom’s lightweight, compact design is simple to control. Its flared bristles and angled head are especially useful for sweeping out corners or reaching other difficult spots. This broom is useful both inside and outside the RV, including on garage floors, patios or decks," according to the company. 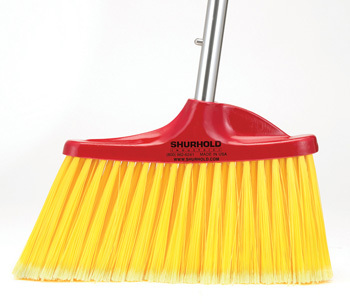 Part of Shurhold’s One-Handle-Does-It-All System, the Angled Floor Broom connects to any of the company's fixed or telescoping handles. Featuring the positive-locking Shur-Lok quick release system, they are constructed from corrosion-resistant aluminum. Shurhold manufactures specialty care items and accessories to clean, polish and detail. Visit www.shurhold.com/rv for more information.